The Hendrickson Bros. J10 Hose Thread Vacuum Breaker is designed to prevent back siphon through any exterior hose bibb connection. Back siphoning occurs when a negative line pressure (vacuum or partial vacuum) causes the reversal of the normal line flow. The J-10 Hose Bibb Vacuum Breaker is an economical alternative to the higher priced brass options. 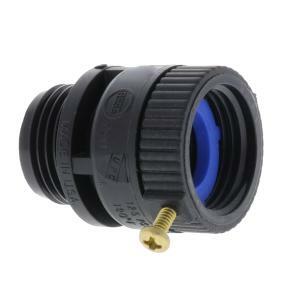 By using this unit, the possibility of back siphoning is greatly reduced thus protecting your potable water supply from contaminants that may be present in the hose line or irrigation system. The Hendrickson J10 meets or exceeds ASSE 1011 and is listed by IAPMO®. Installation to any standard hose faucet is simple and requires only a standard screwdriver with Hendrickson’s unique integral lock screw. Integral lock screw to meet all code requirements. During normal operation the backflow preventer may appear to "leak" after the system or timer is turned off. This is normal as the backflow preventer is allowing water to drain from the system without entering the water supply. The amount of water drained will be equal or less than the water capacity of the drip system. This fitting is not designed to be operated under constant pressure. It must be installed after any timers or valves in your system.